This past weekend I joined a group of Wine Bloggers in Portland Oregon for the 5th annual Wine Bloggers Conference. One of the things I loved about it was putting faces to twitter names and wine blogs that I have followed over the years. I have been managing the group on Twitter @womenwhowine and their corresponding facebook page. During the conference I met some amazing wine writers. The most amazing thing is that it is just one topic - WINE - but there were so many different perspectives and approaches to writing about this one subject. The thing that I loved hearing most was how people were passionate about the personal experiences we share with each other when we get together for a nice glass of wine. Whether we are sharing a nice meal together or a walk through a vineyard we are making connections with our friends and the places where we live. It's all about the experience. Saturday evening we were treated to an amazing 5 course dinner prepared by King Estate Winery. 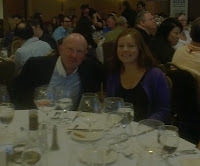 We were even joined by Ed King, CEO and Co-Founder of King Estate Wineries. The Annual Wine Blog awards were announced and the 5 course meal began. It was a wonderful evening and a great way to celebrate a year in wine blogging. To see what you missed you can check out this video provided by the winery.